If your images are sideways or upside down, use the image rotation tool within the GoDaddy Email Marketing composer to set them right. 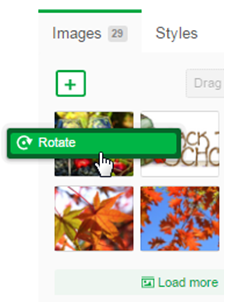 Once you've uploaded your image and added it to your campaign, right-click the thumbnail of the image in the gallery (ctrl-click, alt-click or 2-finger click if you’re on a Mac), and the Rotate option will appear. Clicking the Rotate option rotates the image 90 degrees. And if the image is already placed in the composer, you'll see the rotation reflected there, as well. Right-clicking on the image and clicking Rotate will turn the image another 90 degrees until it’s upside down. You can continue these steps to bring the image back to it’s original orientation. Note: Rotating an image in your gallery will rotate the image wherever it is used in any campaign. So, if you've used this image in another campaign, it will rotate in the same manner there, as well.